It was not just people who attended the Häagen-Dazs Honey Bee Haven open house at the University of California, Davis last Saturday. So did honey bees, carpenter bees, bumble bees, metallic green sweat bees, Gulf Fritillary butterflies and cabbage white butterflies...the "viable ones" as well as those in art form. 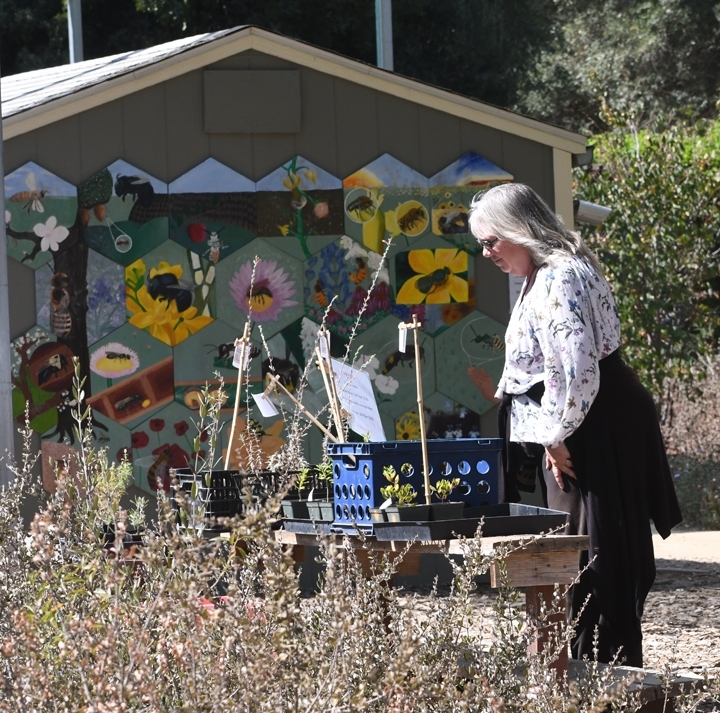 A six-foot-long mosaic and ceramic sculpture of a worker bee, "Miss Bee Haven"--the work of Donna Billick of Davis--greeted the guests as they arrived. 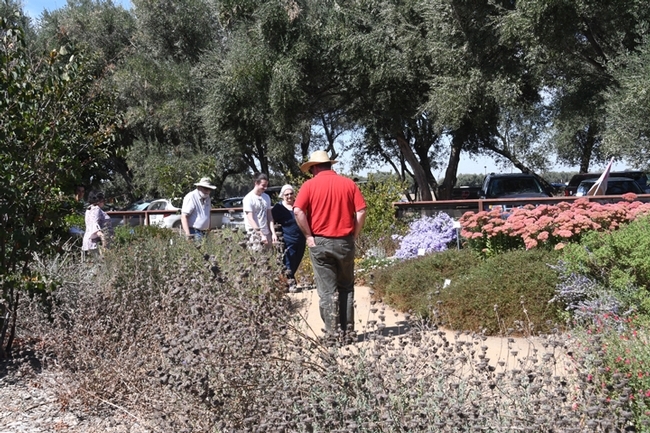 It is part of the permanent art in the garden. Another part of the permanent art is the bee mural on the side of the shed, which features 22 bees, mostly native bees, the work of 22 UC Davis students in 2011. Among them: mason, sweat, squash, leafcutter, blue orchard, carpenter and bumble bees. 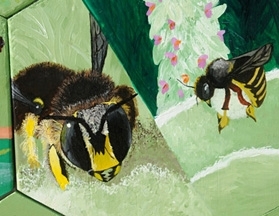 Sarah Dalrymple, then a doctoral student in the Rick Karban lab, UC Davis Department of Entomology and Nematology, headed the bee mural project, which was part of the Entomology 1 class, "Art, Science and the World of Insects," taught by entomologist-artist Diane Ullman, professor of entomology at UC Davis and self-described "rock artist" Donna Billick of Davis. Dalrymble served as the graphics project coordinator and teaching assistant, guiding the students on design, creation and installation of the panels. 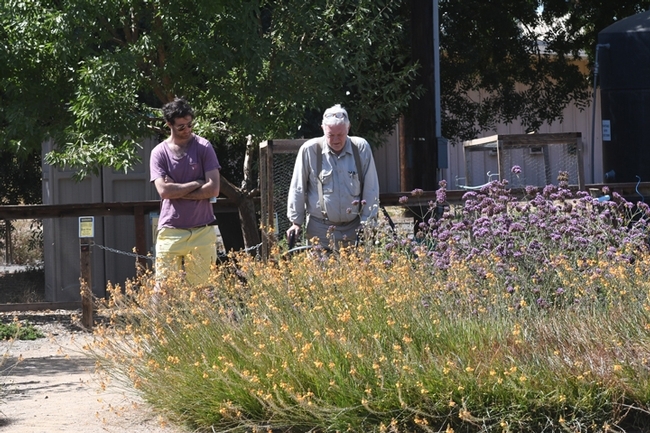 The half-acre bee garden operated by the UC Davis Department of Entomology and Nematology, is located on Bee Biology Road, next to the Harry H. Laidlaw Jr. Honey Bee Research Facility, west of the central campus. 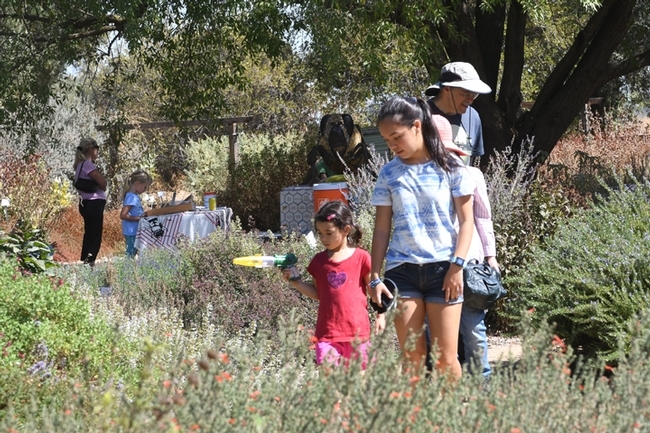 The open house included a catch-and-release bee activity, a plant sale and bee condo sale. 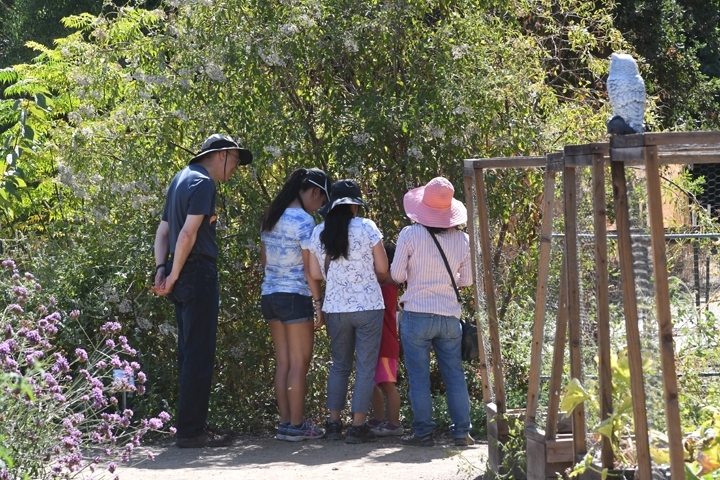 Photographer Allan Jones of Davis, who frequently photographs bees in the haven and in the UC Davis Arboretum, displayed many of his photos. 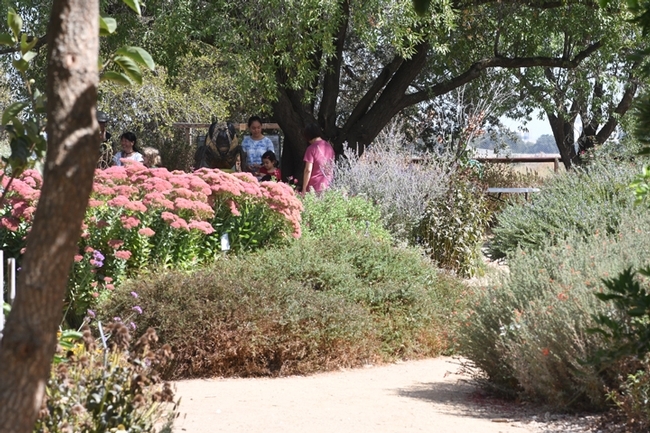 Planted in the fall of 2009, the garden was founded and "came to life" during the term of interim department chair, Professor Lynn Kimsey, director of the Bohart Museum of Entomology, who coordinated the entire project. 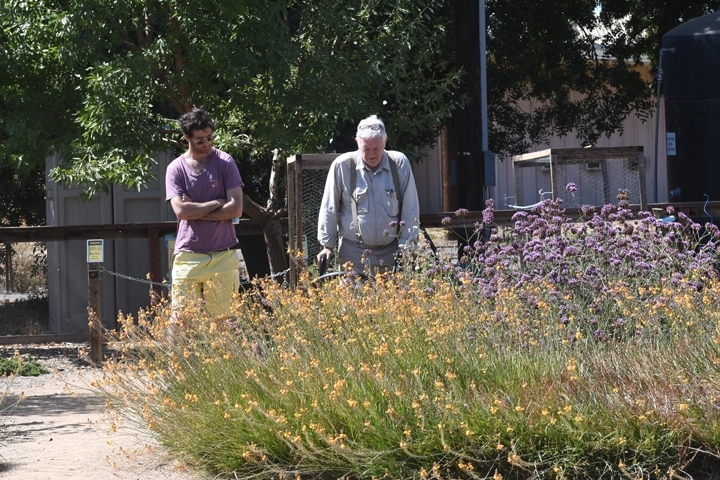 A Sausalito team--landscape architects Donald Sibbett and Ann F. Baker, interpretative planner Jessica Brainard and exhibit designer Chika Kurotaki--designed the garden as the winners of the international competition. 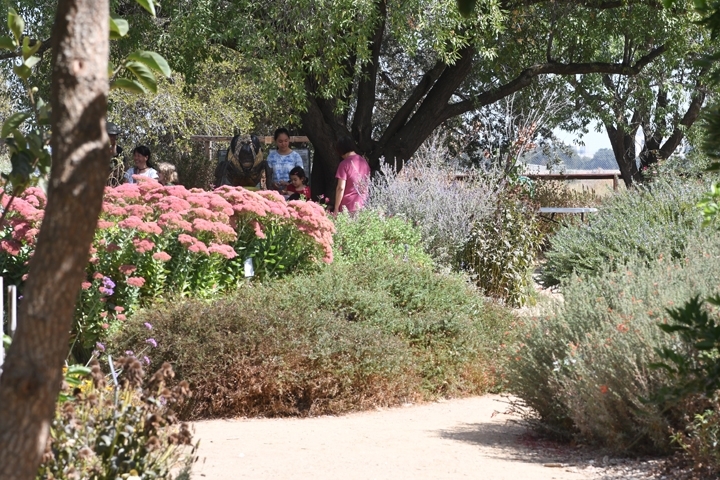 The garden, directed by Extension apiculturist Elina Lastro Niño and managed Christine Casey, academic program manager is open to the public from dawn to dusk.